Even though the curriculum can be tightly specified and controlled by strong accountability mechanisms, it is teachers who decisively shape the educational experiences of children and young people at school. 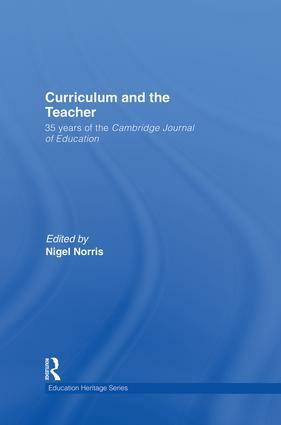 Bringing together seminal papers from the Cambridge Journal of Education around the theme of curriculum and the teacher, this book explores the changing conceptions of curriculum and teaching and the changing role of the teacher in curriculum development and delivery. Taking its lead from Lawrence Stenhouse, Part One looks at ‘defining the curriculum problem’ from a variety of perspectives and includes papers from some of the most influential curriculum theorists over the last thirty years. Part Two explores the framing of new orders of educational experience. It has papers from leading educational thinkers who have contributed to debates about how to make education more inclusive, humane, liberating, creative and educational. Part Three is focused on teachers and teaching. It offers a selection of papers from significant scholars in the field reflecting on the experience of teaching and how it is personally as well as socially constructed and theorised. The papers are drawn from important and eventful periods of educational history spanning the curriculum reform movement of the 1960s and 1970s to the present age of surveillance, accountability and control. A specially written Introduction contextualises the papers. Part of the Routledge Education Heritage series, Curriculum and the Teacher presents landmark texts from the Cambridge Journal of Education, offering a wealth of material for students and researchers in education.